CD80 is expressed on all antigen-presenting cells and is present on podocytes in a number of experimental models of nephrotic syndrome. We tested whether urinary soluble CD80 increased with idiopathic minimal-change disease (MCD). We collected urine and serum samples from patients with MCD in relapse and in remission, patients with nephrotic syndrome resulting from other glomerular diseases (FSGS, membranoproliferative glomerulonephritis, IgA nephropathy, and membranous nephropathy), patients with systemic lupus erythematosus, and normal control subjects. Urinary concentrations of soluble CD80 in patients with relapsed MCD were significantly higher compared with those observed in patients with MCD in remission, other glomerular diseases, and systemic lupus erythematosus with and without proteinuria and healthy control subjects. Urinary concentrations of soluble CTLA-4, which is a negative regulator of CD80, were not statistically different in patients with relapsed MCD compared with those in remission. The urinary soluble CD80/CTLA-4 ratio was >100-fold higher in patients with relapsed MCD compared with those in remission (P < 0.008). In contrast, serum concentrations of soluble CD80 and CTLA-4 did not distinguish patients with MCD in relapse and in remission. In conclusion, urinary soluble CD80 is elevated in idiopathic MCD, which could be relevant to both diagnosis and pathogenesis. Some podocyte antigens are known to be shed, where they can be found in the urine.7 This led us to hypothesize that soluble CD80 (sCD80) might be detected in the urine in patients with MCD. Furthermore, T regulatory cells are known to secrete soluble CTLA-4 (sCTLA-4), which can bind CD80 and block the co-stimulatory activation of T cells.8–10 If T cells are releasing a cytokine that can induce MCD, such as IL-13,11 then one might postulate that an inadequate release of sCTLA-4 might lead to continued activation of the T cells and possibly persistent CD80 expression by dendritic cells. We therefore measured urinary sCD80 and urinary sCTLA-4 levels in children with MCD and compared the findings with healthy children and children with other glomerular diseases. Clinical characteristics of the patients with MCD and control groups are shown in Table 1. We measured urinary sCD80 excretion adjusted for urinary creatinine in patients with MCD (n = 19), patients with other glomerular diseases (n = 11), and normal control subjects (n = 9; Figure 1A). Urinary sCD80 excretion was elevated in patients with MCD in relapse compared with patients with MCD in remission (P < 0.001), patients with other glomerular diseases (P < 0.001), and healthy control subjects (P < 0.01). When we studied eight patients with MCD during relapse off immunosuppressive therapy and 1 mo after remission was induced, the differences were still marked (P < 0.01; Figure 1B). In four patients with MCD, we measured urine CD80 excretion during various stages of their nephrotic syndrome. In these patients, changes in proteinuria were paralleled by changes in urinary sCD80 excretion (Figure 1C). Urinary sCD80 was not significantly elevated in healthy control subjects or in patients with nephrotic syndrome and other glomerular diseases when compared with patients with MCD in remission (Figure 1A). In patients with MCD in relapse, there was no correlation between sCD80 and proteinuria (Figure 2). (A) sCD80 urinary excretion (ng/g creatinine) in patients with MCD and control subjects. Comparisons: P < 0.0001 between patients with MCD in relapse and MCD in remission; P < 0.001 between patients with MCD in relapse and other glomerular diseases; P < 0.001 between patients with MCD in relapse and healthy control subjects; P = NS among patients with MCD in remission, patients with nephrotic syndrome and other glomerular diseases, and normal control subjects. (B) Serial sCD80 urinary concentration (ng/g creatinine) in eight patients with MCD during relapse and remission. P < 0.01 in patients with MCD with relapse versus remission. (C) Serial sCD80 urinary concentrations (solid line) and concomitant urine protein/creatinine ratio (bars) in patients with MCD. Correlation between urinary sCD80 and proteinuria in patients with MCD in relapse. In contrast with the urinary findings, serum sCD80 concentrations were not different among patients with MCD in relapse, patients with MCD in remission, and normal control subjects (307 ± 78, 297 ± 58, and 374 ± 28, pg/ml, mean ± SEM, respectively). In a separate study, we examined concomitant urine sCD80 and sCTLA-4 concentrations during relapse and during early remission on therapy in patients with MCD. Results are presented in Figure 3A. As in our previous study, urinary sCD80 was significantly increased during relapse when compared with values measured during remission (P < 0.009). Urinary sCTLA-4 concentrations in patients in relapse were not statistically significant to those observed in patients in remission (P = 0.25). When the ratio of urinary sCD80 to sCTLA-4 was evaluated in patients with MCD, the ratio changed from 10.80 ± 6.10 during relapse to 0.10 ± 0.05 during remission (mean ± SEM; P < 0.008; Figure 3B). In contrast, the same ratio in patients with FSGS and proliferative glomerulonephritis and nephrotic syndrome was 0.66 ± 0.28 (mean ± SEM). (A) Urinary excretion of CD80 (ng/g creatinine; mean ± SEM) and sCTLA-4 in patients with MCD in relapse and in remission. (B) Urinary ratio of CD80 (ng/g creatinine) and sCTLA-4 (ng/g creatinine) in patients with MCD in relapse and in remission. Serum sCTLA-4 levels in patients with MCD in relapse (376 ± 174 pg/ml, mean ± SEM; n = 8) were not statistically different from the values observed for patients in remission (229 ± 86 pg/ml; n = 9). No significant difference in serum sCD80/sCTLA-4 ratio between relapse and remission was observed (1.8 ± 0.6 [n = 8] and 6.1 ± 5.1 [n = 7], mean ± SEM, respectively). Urinary CD80 levels in patients with systemic lupus erythematosus (SLE) without proteinuria (urinary protein-creatinine ratio <0.5; 111 ± 34 ng/mg creatinine, mean ± SEM; n = 13) were not statistically different from those observed for patients with proteinuria (136 ± 65 ng/mg creatinine, mean ± SEM; n = 8; P = 0.96). Urinary CD80 values including all patients with SLE (127 ± 31 ng/mg creatinine, mean ± SEM) were significantly lower than those observed for patients with MCD in relapse (P = 0.0001) but not significantly different from those seen in patients with MCD in remission and healthy control subjects. In this study, we demonstrated that urinary sCD80 was elevated in MCD during relapse with levels returning to the normal range in remission. Furthermore, serial studies showed that the urinary sCD80 excretion paralleled changes in proteinuria in four of the patients. The increase in urinary sCD80 was not simply a reflection of proteinuria per se, because it was not observed in patients who had proteinuria and/or nephrotic syndrome and had other glomerular diseases. In addition, serum sCD80 levels were not different for patients with MCD in relapse from patients with MCD in remission and normal control subjects, documenting that the increased urinary excretion could not be accounted for by higher serum levels. Patients with lupus nephritis and proteinuria have been reported to have CD80 expression on their podocytes.5 Despite this observation, we did not find urinary sCD80 levels to be increased in patients with SLE and proteinuria. Indeed, levels of sCD80 in the urine were not different from those observed in healthy control subjects and in patients with MCD in remission. In addition, sCD80 urinary excretion in patients with SLE was significantly lower than that seen in patients with MCD in relapse; however, some of our patients with SLE and with or without concomitant proteinuria did have increased urinary sCD80 excretion. Urinary sCD80 levels are difficult to interpret in patients with SLE because these patients have been reported to have elevated serum sCD80 levels unrelated to the activity of the disease.12 Because sCD80 has a molecular weight of 23 kD, the increased urinary sCD80 seen in some of our patients with SLE could be due to higher serum sCD80 values. The co-stimulatory activation of T cells can be blocked by sCTLA-4 released by T regulatory cells,8–10 and sCTLA-4 may also negatively regulate the CD80-bearing dendritic cell.9 This led us to hypothesize that sCTLA-4 might be reduced in patients with MCD in relapse. Although we detected no statistically significant differences in serum or urinary CTLA-4 between patients with MCD in relapse and in remission, we did observe that the ratio of urinary sCD80 to sCTLA-4 was markedly higher in patients with MCD in relapse compared with remission. 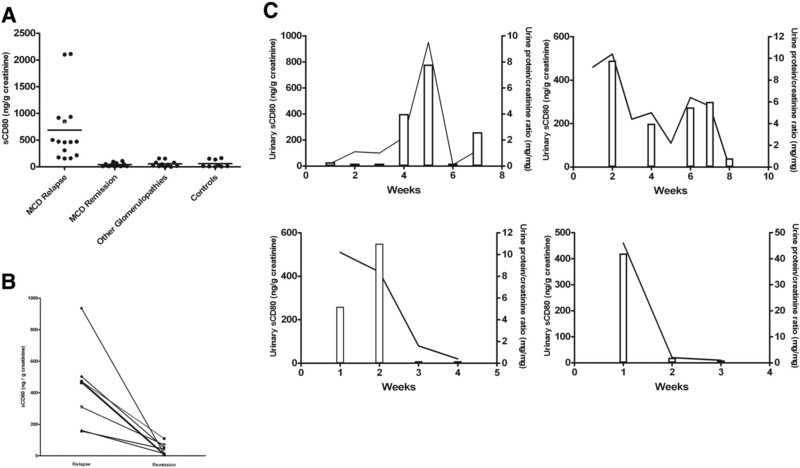 The relative decrease in urinary sCTLA-4 to sCD80 during relapse could be due to the inability of the T regulatory cells from patients with MCD to release sCTLA-4. We recently demonstrated that T regulatory cells are normal in number but severely dysfunctional in patients with MCD in relapse.13 More studies are needed to confirm our hypothesis that this defect could result in uncontrolled CD80 podocyte activation with persistent proteinuria. This pilot study raises several interesting questions. First, it raises the possibility that urinary sCD80 levels may be helpful in the diagnosis of patients with MCD. Although larger patient populations will be necessary to study before concluding that this test may be specific for MCD, it is interesting that none of the four patients with FSGS and nephrotic-range proteinuria had elevated sCD80 levels. Second, it raises the question of the source of the CD80. Theoretically, a number of cells within the kidney could produce CD80, including podocytes, macrophages, dendritic cells, and tubular cells.5,14,15 If the podocyte is the source expressing CD80, then it could be relevant to the pathogenesis of the disease. In this regard, we were recently able to demonstrate CD80 expression in a few biopsies of patients with MCD in relapse (unpublished observations). In conclusion, urinary sCD80 is increased in patients with MCD in relapse and seems to correlate with the activity of the disease. Further studies to examine the role of urinary sCD80 as a diagnostic, pathogenic, and prognostic marker are indicated as well as to determine the role, if any, that sCTLA-4 has in this process. Relapse of the nephrotic syndrome was defined as the presence of proteinuria of ≥3+ using the tetrabromophenol-citrate buffer colorimetric qualitative dipstick test, confirmed by a urine protein/creatinine ratio >2.0, and a concomitant serum albumin of <3.5 g/L during the course of the episode. Complete remission was defined as no proteinuria using the colorimetric qualitative test and a urinary protein/creatinine ratio of <0.2 on a random urine sample. We measured sCD80 in blood and urine using a commercially available ELISA kit (Bender MedSystems, Burlingame, CA). We measured sCTLA-4 in blood and urine according to Oaks and Hallet10 with minor modifications. We measured urinary creatinine and proteinuria using an autoanalyzer. We conducted statistical analysis using nonparametric ANOVA (Kruskal-Wallis test). We determined differences between means with the Mann-Whitney U test or the Wilcoxon signed rank test when applicable. 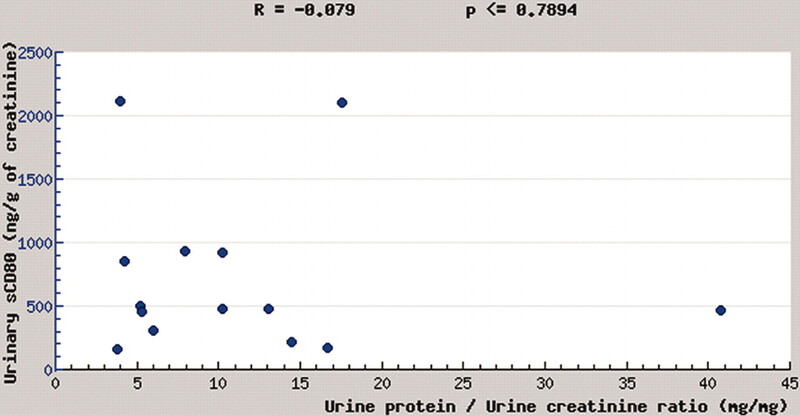 We calculated the correlation between urinary sCD80 and urinary protein using Spearman's correlation coefficient test. Support for this study was provided by startup funds from the Department of Pediatrics, National Institutes of Health grants DK-52121 and HL-68607, Gatorade funds from the Division of Adult Nephrology, and a T32 training grant for L.D. (DK-07518). R.J.J. 's current affiliation is Division of Renal Diseases and Hypertension, University of Colorado Denver, Aurora, CO.
Podocyte Expression of B7-1/CD80: Is it a Reliable Biomarker for the Treatment of Proteinuric Kidney Diseases with Abatacept?